I'm sure nearly all of us love to pamper ourselves, but a lot of us also don't have time to go for the full whammy on a regular basis. I like to dedicate my Sunday evenings to pampering myself, but it isn't a regime that takes hours away from you. The first thing I do is paint my nails so they are ready for the week ahead (or the first half of it perhaps), and I do this in the late afternoon early evening so that they are dried before I have a bath/shower - trust me I have made the mistake before and they didn't look too great. I have currently been loving Greenberry from the Barry M Gelly Hi-Shine range. Having a bath is the next step, but if you want to shower (I often do when I'm washing my hair), use a nice shower gel so you feel like you are still being pampered - Soap & Glory rule for this. But, when you're bathing, Lush offer the best items, from bath bombs to bubble bars. I still have some of my Christmas Eve Bubble Bar left from when I got a bunch of products in the sale, so I'm using that up. For something a little more interesting, I love the FUN Range. After a bath or shower, using a body butter is the best way to make your skin love you. My current favourite is the Soap & Glory Righteous Butter, but I also like to use the Sugar Crush offering. The Burt's Bees Coconut Foot Cream is also something I enjoy using, as my feet often go unloved (I hate feet, writing this is making me feel a little uncomfortable), but seriously this is a thick balm which massages in like a cream/oil - I love it. Finally, what is a pamper evening without a face mask. For something cleansing, and the one featured in the image, I reach for the Super Facialist by Una Brennan Tea Flower Deep Clean Mask which really helps my skin and the difference is noticeable for me. Another one not shown is the Origins Drink Up 10 Minute Mask which hydrates my skin so well and allows it to look plump in the morning. I love a good face mask and the Una Brennan one is a great clarifying mask, I find this is really similar to the Aesop parsley seed mask! anything from Lush is definitely a pamper essential! 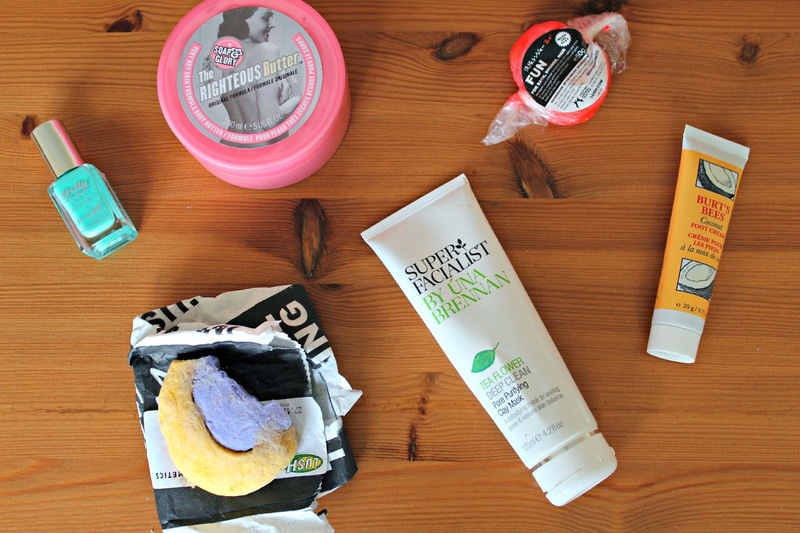 I think I've never seen a blogpost about pamper evenings missing Soap and Glory. Their stuff is amazing! I have heard so many good things about the facial mask! I always keep popping into boots for it and never finding it! I must order online... I love using the soap and glory moisturiser with the pump my hands and nails feel like slimey!